Its a touchy subject, I know it happens, you know it happens, but how do we approach that pesky fur that annoyingly appears above our lip! Well, stay with me and we’ll go through a few of my favourite, and most successful methods! For some its an issue, for others its not, but either way, it frustrates enough of you guys for me to be concerned about it. That’s right, the old fashioned way, a regular pair of tweezers is one of my recommended ways to remove those hairs. It’s not the fastest method of hair removal but it’s definitely one of the most accurate. The results last a couple of weeks which is ideal, all that’s required is a little patience. One massive pro to tweezing is simply how cost efficient it is! They literally cost anywhere from £1.00 to £15.00 – and the latter is for the best tweezers you’ll ever see! There’s a lot to be said for waxing strips, they’ve been around for a long long time and that’s simply because they work! My personal preference is the Rio Total Body Waxing kit, i’ve done a review on it here. I tried this product purely because it was the highest rated on Amazon – I took the risk so you don’t have to! It worked out well though, suitable for ALL types of waxing, both soft wax for your arms and legs, and salon hard wax for those extra sensitive areas. I don’t need to go over the Rio much more, check out my review and see for yourself, but it’s definitely worth a go for the upper lip fur. This probably won’t come much of a shock to you if you follow my website, but yes, i’m once again recommending epilators! As we’re dealing with our face, we need something a little different to our normal body epilator. We need something a little smaller that can manoeuvre in a small area but still packs a bit of a punch so we don’t prolong the pain you do get from an epilator – we’re still pulling hairs from the root here! I don’t want to bombard you with epilator after epilator here so i’m only going to show you my top 2 picks for the upper lip. It’s small, it’s convenient, it’s made for the upper lip – perfect for awkward areas. A narrow strip of rotating tweezers, 9 of them to be precise is super effective. 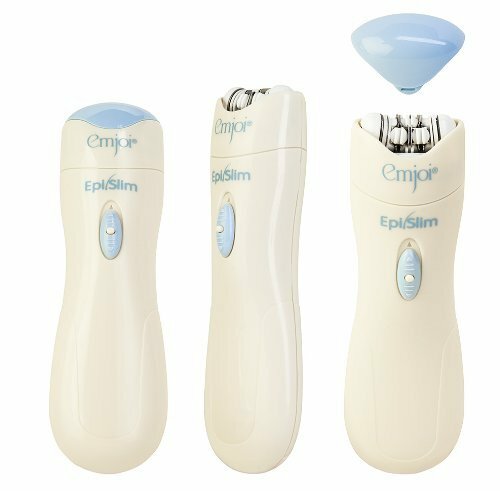 The Emjoi has been my epilator of choice for my upper lip and I couldn’t be happier with it. Brilliant at getting the tough spots as I said and not really painful, comparable to plucking an eyebrow hair with tweezers – a little pinch. I’ts not at all threatening. a bigger epilator can be quite intimidating but the Emjoi is so small and cute! At a very reasonable price aswell it’s a great buy, can also be used as a travel epilator too – not that you need to with 4-6 weeks results. I’ve reviewed this epilator previously, it came top of the comparison table and for a reason. It’s just the best on the market – Braun have made plenty of epilators over the years so naturally they will have got better and better as newer technology is discovered. 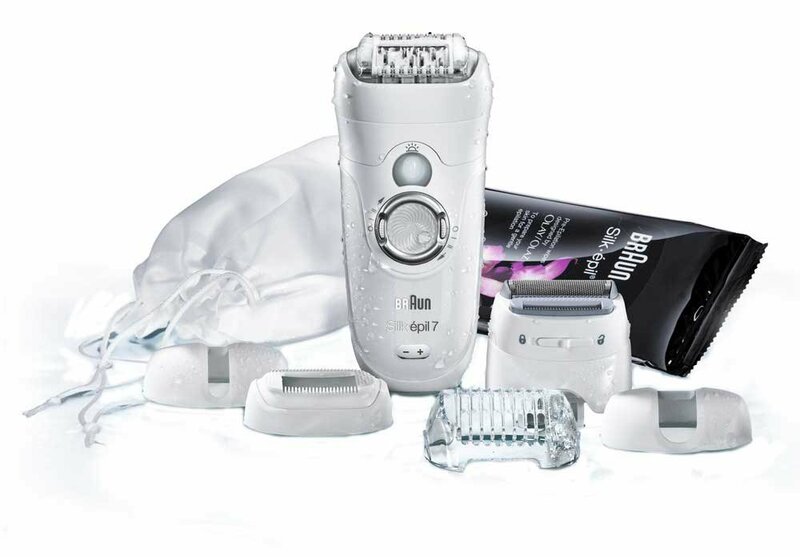 The Braun Silk-épil 7 7681 is kind of the Ferrari of the epilator world! It works both wet & dry. Has 40 tweezers which compared to the Emjoi’s 9 is crazy. A pivoting head which as you can guess, makes it easy and really comfortable to get round the tough areas. Several different speeds, so you can zip through your legs and slowly, accurately get the upper lip! Last but not least, there are 5 different heads/caps to make it even more useful – most importantly though a specific face cap which will is incredible against the upper lip hair. It’s obviously on the more expensive side but it’s a great bit of kit. There is no doubt it will do what you want, and if you don’t believe me, try it.. I promise you will not be disappointed! So there we have it. Hopefully it helps you out, that’s the aim. I’ve done all the hard work for you, just the easy bit for you and give them a go!